The second Climate Whirl workshop combines practical and philosophical questions around scientific measuring in a forestry field station. It will introduce the participants methodologies used in the natural-scientific and eco-socially engaged artistic research. This hands-on workshop introduces the participants to the construction of scientific and DIY tools for measuring and converting the forest into the data. We will build chamber systems, calculate the albedo and the growth of the trees, and discuss artistic and scientific approaches to the climate change studies, and, analyze the collected data. Participants will get experience how the theoretical thinking of the researcher affects the results he/she will get. The 3-days workshop happens mostly outdoors, in the woods surrounding the Hyytiälä Forestry Field Station facilities. 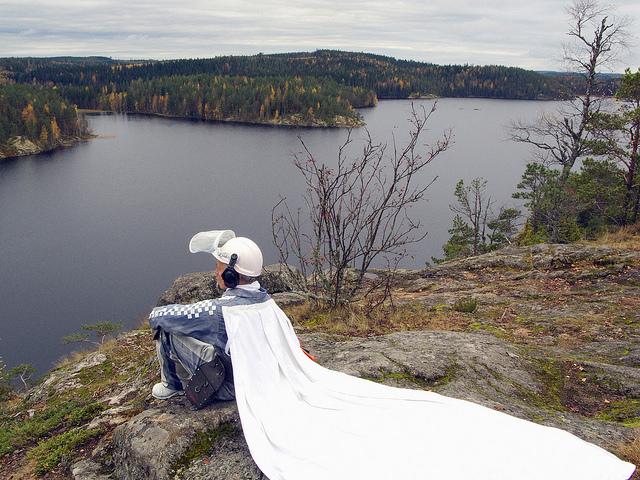 The first Climate Whirl workshop, lead by German artist Agnes Meyer-Brandis was celebrated in August, 2014. Please send an email to ulla@capsula.org.es by Monday 2nd March, to register to the workshop. Title " Climate Whirl Workshop 2015" and your name. We would like to have max 100 words description of you and your motivations to take part to the workshop. Max 15 participants will be selected. The selected participants will be informed by 16th March 2015 and prepared with more detailed information of the workshop. Accommodation during the workshop will be provided for the participants as well as the transportation to Hyytiälä Field Station from Orivesi train station. Kone Foundation, University of Helsinki, Aalto Biofilia and Institute of Art and Subjective Science. between climate and forests, as well as on the role of boreal forests in climate change. Elisa Halmeenmäki is MSc and PhD student of environmental sciences, and her research is about methane emissions in boreal forest. The main method is chamber measurements, from forest floor and trees. As environmental scientist she has a diverse background of studies related to environmental protection. Kourosh Kabiri is forester with background studies in forest silviculture in Iran. Currently he lives in Finland and is a PhD student in the Forest Ecophysiology group at University of Helsinki where he is studying the structural regularities in Scots pine in Hyytiälä Research Station. Mari Keski-Korsu is an interdisciplinary artist who explores how ecological and socio-economical changes manifest in people’s everyday life. How macrocosm becomes microcosm and vice versa? Her works have a political nature but they tend to also have a humorous twist. Often, the starting point is in location, a place and people’s relations to it and collaborations with different kinds of communities and individuals - including other species. She is interested in relations in between art, activism, politics and science. Her work has been exhibited in Europe and in many other countries around the world. Janne Korhonen is an atmospheric scientist, working as a doctoral student at Department of Forest Sciences at University of Helsinki. His main research interest is transport of organic and nitrogen compounds inside forest, as well as between forests and the atmosphere. In addition to research, Janne is working on Climate Whirl concept, focusing on intersection between science and arts, popularization of science and science education.